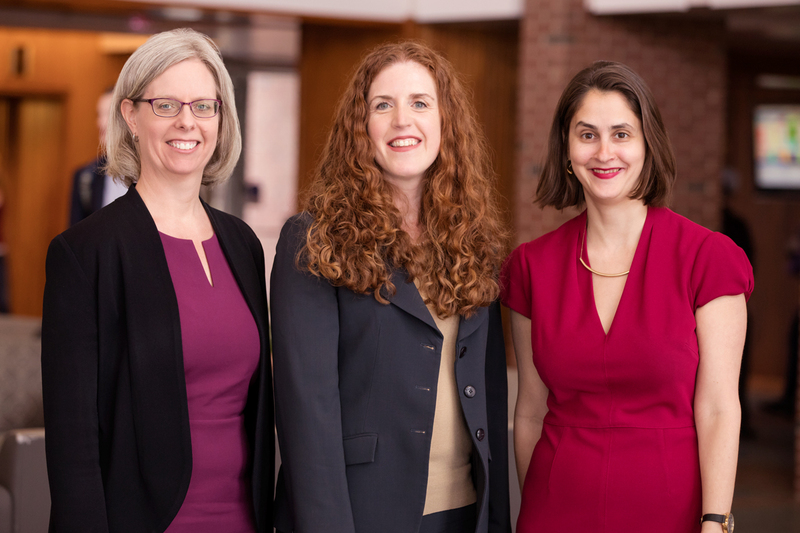 A new paper from a team of U. of I. legal scholars explores restorative and transitional justice in the #MeToo movement. From left, Jennifer Robbennolt, the associate dean for research at the College of Law and co-director of the Program on Law, Behavior, and Social Science; Colleen Murphy, the director of the Women and Gender in Global Perspectives Program at Illinois; and Lesley Wexler, a professor of law. The paper documents the restorative justice aspects of the #MeToo movement – acknowledgement, responsibility-taking, harm repair, nonrepetition and reintegration – and explores the steps taken, most prominently by the Time’s Up movement, to amplify the voices of survivors, seek accountability and encourage access to the legal system, and change workplace practices and dynamics. “We take a look at the ways in which people accused of sexual misconduct have responded to those accusations and how those responses have succeeded or failed in terms of restorative justice,” said Robbennolt, the associate dean for research at the College of Law and co-director of the Program on Law, Behavior, and Social Science. The scholars also examine the movement through the lens of transitional justice. “We identify some shared features of transitional societies and the #MeToo setting, including structural inequalities, a history of denial and the normalization of wrongful behavior, and uncertainty about the way forward,” Wexler said. It remains unclear where things will end up as a result of the movement, said Murphy, also a professor of philosophy and of political science at Illinois. It could come in the form of public gestures, such as the recent calls for “inclusion riders” in Hollywood contracts, which specify a level of diversity in a production’s cast and crew. “When ‘Black Panther’ actor Michael B. Jordan announced that his production company was going to include inclusion riders in all of their contracts – sure, that’s a single individual doing it, but if others follow suit, it could become the industry standard,” Wexler said. “That, at least, represents a step in the right direction. When you have those very public gestures being done, there’s a hope that they will be replicated and eventually become the norm,” Murphy said. If nothing else, it’s a moment for “creative thinking about what kind of efforts will lead to changing the norms that structure interactions between employer and employees, at a very broad level,” Wexler said. The paper will be published in the University of Illinois Law Review. Editor’s notes: To contact Colleen Murphy, call 217-244-0675; email colleenm@illinois.edu. To contact Jennifer Robbennolt, call 217-333-6623; email jrobbenn@illinois.edu. To contact Lesley Wexler, call 217-244-3449; email lmwexler@illinois.edu. The paper “#MeToo, Time’s Up, and theories of justice” is available online.